In Victorian England, a governess (Deborah Kerr, Black Narcissus) finds a job tutoring two orphans (Pamela Franklin, The Prime of Miss Jean Brodie, and Martin Stephens, Village of the Damned) at a huge mansion in the English countryside. As she deals with her new responsibilities, the governess may or may not be experiencing encounters with supernatural forces. Based on Henry James’s acclaimed novel The Turn of the Screw, adapted by William Archibald and Truman Capote, directed by Jack Clayton (Room at the Top and Sons and Lovers), The Innocents is not for the fainthearted! The Innocents remains one of the most unnerving exercises in Gothic horror ever, achieving its eerie atmosphere via superbly constructed chiaroscuro images and expert use of deep focus (shot in glorious CinemaScope by Freddie Francis). This is a visually stunning, thematically complex “ghost story,” with superb acting and a strong emotional core. 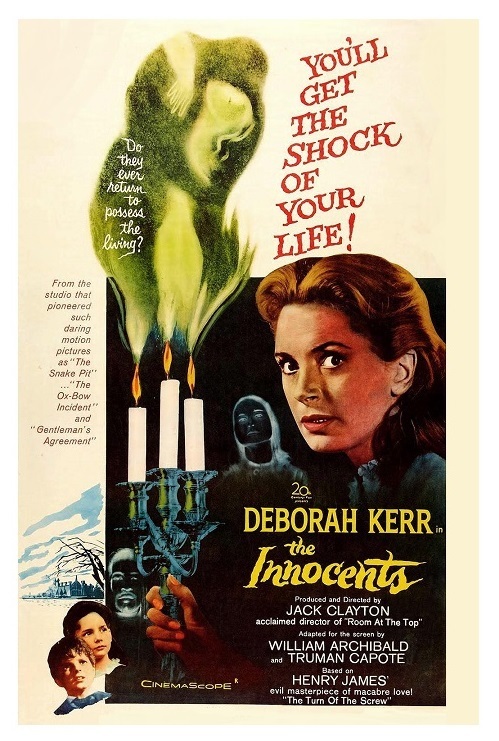 The Innocents shrewdly expands the psychological undertones of the original text, while being respectful of author James’s original intentions. British director Clayton operates on the premise that the audience is smart. I know, shocking, isn’t it? He chooses to suggest rather than to show things, allowing the viewer’s own imagination to fill in the gaps. There is an element of ambivalence in the story that Clayton embraces wholeheartedly, an attitude that pays off in great dividends throughout the entire film. It’s very stimulating to sit through a movie that never, never hand-feeds you any answers. Clayton makes another astute decision: the filmmaker places the entire movie on Deborah Kerr’s shoulders and the strategy really works — this is perhaps her finest performance. Kerr’s real accomplishment, however, is to make us see things from her point of view regardless of the fact that she could be completely mistaken about her interpretation of many situations. As the governess becomes more determined in finding an explanation to the bizarre events she is witnessing, the uncertainty of what is really happening in the mansion transforms a far-fetched ghost story into a human tragedy. It’s worth noting that Kerr’s governess seems to be the only person who sees something wrong with the kids. She’s also the only one seeing ghastly apparitions. The sympathetic housekeeper tries but can’t see anything. It’s quite possible that the governess, the daughter of a preacher and a clear victim of Victorian piousness, finds it easier to believe in demons and possessions than to acknowledge the over-sexualization of her young pupils. The Innocents plays it right in the middle and at the end you are still not quite sure what to believe. Pamela Franklin and Martin Stephens are great as the kids. Child actors often come across as a bit rehearsed, but not these kids — they are natural performers. These talented muppets keep up with Kerr’s superb work. Sir Michael Redgrave (The Hill) plays the children’s wealthy uncle. The cast also includes Clytie Jessop (Torture Garden), Peter Wyngarde (Flash Gordon), and Megs Jenkins (Oliver!) as Mrs. Grose. Even after more than five decades, The Innocents remains the film that all other ghost stories will be measured against; a textbook film lesson in how to tell this kind of story in an effective way — this film is an absolute must for horror film lovers and serious students of the power of cinema. The Innocents truly deserves to be rediscovered by a new generation of moviegoers. B&W, 100 minutes, Not Rated. Wonderful review, one of my favourite psychological horror films with a Gothic atmosphere. Have you seen the 1992 version with Julia Sands? If you have, how does it stack up? No. I haven’t seen it. Is it any good?